Hi everyone! I hope you are enjoying the curriculum discussions we’ve been doing lately. I’m hoping they will help you in choosing curriculum for your own family! Today I want to focus on the subject of Geography. Of course our family had a great time with the Expedition Earth World Geography, then moved to Road Trip USA Geography after that. Both are full year curriculum for elementary aged students. And they’re both really fun, hands-on, visual, and did an excellent job of getting my kiddos to remember what they learned! Expedition Earth World Geography curriculum is is a hands on world geography curriculum that covers 31 countries across the world. It is designed primarily for K-5 students. Students will learn the continents, oceans, people, cultures, animals, climates, try new foods, crafts and more, all through hands-on activities! Get ready for an exciting voyage across the world! Come along as we walk on the Great Wall of China, wander through the Amazon Rainforest, and climb the Egyptian Pyramids! Within this curriculum you’ll discover the sights and sounds of 31 countries across the globe. You’ll get hands-on with fun activities, crafts, recipes and more! So grab your passports, and get ready to go! It’s time for Expedition Earth! 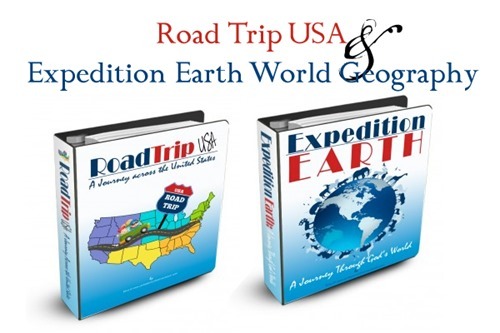 Road Trip USA is a United States Geography and History curriculum. From the signing of the Declaration of Independence, to the wild west, you’ll uncover all the secrets this Nation has to offer! Within this curriculum you’ll discover the sights and sounds of all 50 states, including state symbols, U.S. Presidents, famous people, landmarks, historical events, and much more! This curriculum is geared for elementary aged students. For you history buffs, this is a great introduction for young learners! You will start out learning about the Constitution, Declaration of Independence and Revolutionary War. Then you’ll move south to learn more about the Civil War and Underground Railroad. From there you’ll journey with Lewis & Clark through the mid-west, live with the Hopi in the southwest, then venture out into the wild west on a covered wagon ride! So grab your Travel Logs, and pack your bags! It’s time for a Road Trip! Buy once, print multiple times for your family. Can be pricey if you have a lot of student copies to print. 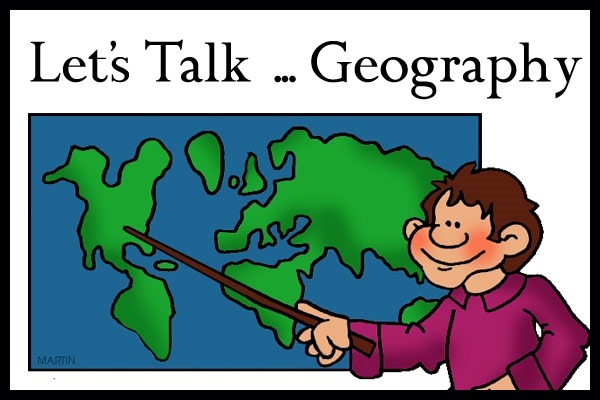 I would love to hear what you all do for Geography, and if you used one of my curriculum, feel free to comment on how it went or if there’s anything you’d like to have added or changed to make it easier to use! What are your favorite Geography curriculum, resources, websites, etc? Leave a comment below discussing your choices for this year and why. Note: Please keep today’s conversations geared towards Geography, I will be posting one for each subject separately so we can keep our comments organized. We do Maps, Charts, and Graphs and a program called Classically Catholic Memory which is a Catholic Classical Conversations. CCM has 5 sets of maps for the year and they are supposed to label them and finger trace around the area being studied so they can draw that map from memory by the end of the year. We really like both programs. Interested in starting this with my kindergartener. Did you buy the maps from CCm? And start with alpha year as well as maps charts and graphs level a? Also in CCm, do they learn about the presidents and such while in the North America section do you know? We started our journey of the 50 states before you created Road Trip USA. I used the Discover America series a our starting point. (Those are books such as F is for First State, M is for Magnolia, Y is for Yellowhammer). Then I added books for each state based on my search of my library’s catalog and a book called Simply Stated from Kreative Simplicity. We’re currently doing something similar for world geography. We use your curriculum and the kids and I LOVE it!! Such a great price too! Just wondering if you have heard of Rick and Marilyn Boyer. They have a website/blog called The Learning Parent (now called Character Concepts)….they have a wonderful book out called “For you they signed” about the declaration of independence and “Portraits of Integrity”, using history to show character values. Thanks Erica for all your dedicated work to this blog!! We are using Expedition Earth this year for geography. I actually use it in a co-op class with 11 children. I have added in some extra hands on activities and I also like to show pictures of each country from library books. Overall, I am very happy with it. The best part is that at the end of the year each student will have a huge geography binder to help them remember all the countries that we visited! We did your Road trip USA this year and my kids enjoyed it. The only thing I would add would be mapping activities where the kids can label cities, landmarks, lakes, rivers, etc. but overall, it is a fun We have also used Trail Guide to World Geography. It has a lot of activities that you can do, like cooking, art, etc, but you have to piece together what you want to teach and I prefer curriculum that gives me somewhat of a plan. We stuck to mostly the daily questions, mapping activities, and studying the animals of the region. You can use it multiple times and there are questions for different grade levels. Every year I struggle with deciding what to do for this subject so I look forward to what others have tried. We loved a study of the States using Simply Stated as our guide. It is primarily a book list for each state to read your way across the USA. We notebooked each state with pages from Hold That Thought Cd on the States, traded postcards with other families from each state, and filled in a generic page I created for each state covering Who, What, Where, and Why. Sometimes we would make food related to that state and later added copywork using a book from Queen Homeschool Supplies. This took us 2 1/2 years but was very memorable. We like using puzzles, especially United States puzzles. Sometimes we time each other to see who can get done the quickest. 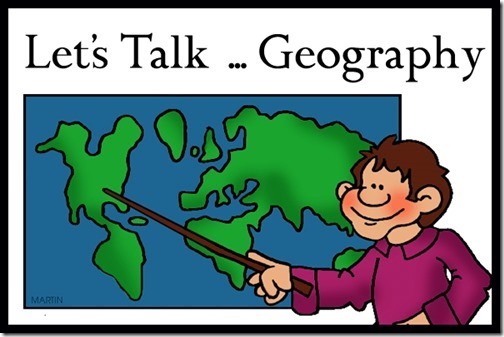 We have also enjoyed the Classical Conversations geography resources. I gave my children a page of landmarks (rivers, lakes, mountains, trails, etc) and we just kept adding a new page each week. Next year will be my first year homeschooling and I plan on using classical conversations for history and science. Do you think that is enough? I will have a 1st grader and k3. Amy, it will be more than enough! Don’t stress out about this stuff while your kids are little. Let them learn to love learning and then in about 3rd grade things should get harder each year from there. CC will be a great base for you to use and then just read to them every day and walk outside and dig in the dirt and learn about the things you see and the places you go. Enjoy them at this stage. We started homeschooling when my youngest was starting kindergarten and it will always be one of my greatest achievements that I taught her to read and love reading. When I hear her read aloud, I think to myself, I taught her to do that. The years teaching littles are the best, when they are in middle school you will look back to these years and the memories you will be making next year will feed your soul. I’ve been looking for a good US study and this one looks great. My question is this: does anyone know of a curriculum to cover the discovery of America up to the revolutionary war where Road Trip USA begins? Check out History Pockets; they tend to give a great history of different time periods: such as Colonial America and Life of Plymouth Colony. (I consider this covering both geography and history) with lots of hands on activities (lapbook style). What about Beautiful Feet’s Early American History? Some of it may overlap, but it covers Leif Ericson and Columbus. I just recently learned about your curriculum and am very intrigued with it, possibly using it for my youngest (2nd grader). However I do have a 6th grader, and afraid it may be a little to “elementary” for him. Any suggestions out there for the older one? I am considering using Apologia “Around the World in 180 days”. Any thoughts? You hit my button! Yes, I would encourage you to try Around the World in 180 Days. My 6th grader is doing that curriculum this year. Personally, I would not try 180 Days for children any younger..maybe 5th grade. My 6th grader loves it..she is learning how to do research, write and do a variety of activities all while learning about each continent. We are beyond pleased with it. My 2nd grader is doing Expedition Earth. She is enjoying that and keeping me on my toes with her daily assignments. We feel blessed to have found two curriculums that have both worked well for our family and at a great price I might add. Most of the books we use for both of these are checked out at our library or through the interlibrary loan. Thank you so much! I will definitely check it out this weekend at the homeschool conference and Expedition Earth for my youngest. You want learning to be fun; and what great resources that are out there to implement that. Thank you. This year was my first year homeschooling and I have just stuck with using the Lifepac series. The only problem with it is that for a 1st grader, the history and geography doesn’t teach about the world. It teaches more about life values and how God is in our lives. I think next year I will try your curriculum. Do you teach USA and World together? Should I wait until all 3 of my kids are in elementary grades before I start it? I’m not sure what they actually learn in PS at this age.